Evolution is not just a theory, nor is it something that applies exclusively to living beings. Case in point – Toyota India. Look back nearly 17 years and the brand started its journey with the Qualis, which was rather outdated even back then. Evolution, however, made Toyota move up the price chain. So while Toyota’s most desirable model was once a bare-basic people mover that could be yours for Rs 5 lakh, today, it’s a gargantuan, feature-loaded SUV that costs at least 5 times that! 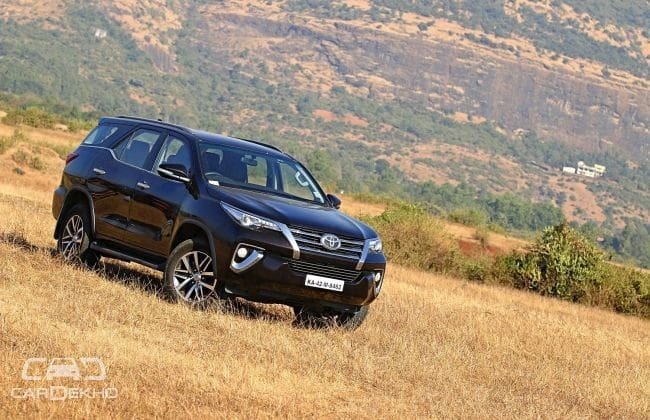 The 2nd generation Fortuner is finally in India. It’s been built new from scratch, gets new features and a different range of powertrains as well. The SUV comes with the same promise as the Innova Crysta – of thoroughly outshining its predecessor. So, has it succeeded? The new Fortuner’s silhouette is familiar, but the SUV has gone under the knife quite literally. The butch presence remains, but the styling is quite flashy, evidenced by the number of people staring at it on the road. Bits like the ‘saber-toothed’ chrome front grille and slim LED headlights add a heap of ‘get out of my way’ aggression, while making it look like something from the Lexus stable. The increase in length is evident, while the marginally reduced height, window-line kink and floating roof effect make it look more athletic. Due credit to the 18-inch wheels too. Like the clusters up front, the tail lights are sleek LED units, while the ‘Fortuner’ engraved rear chrome applique is a throwback to the outgoing generation. Yes, some may find the styling loud, but it does grow on you with time. Like an old-fashioned SUV, you still have to climb into the cabin, but you do get a smart-key which is a pleasant touch. Once in, the leather-draped seats offer fantastic all-round support and you certainly get that must-have commanding driving position. In the cockpit, you’re welcomed by an entirely new layout that fixes one of the old model’s biggest drawbacks – its outdated interior. The dashboard sits quite tall and gets premium silver highlights and there’s a generous dose of soft leather all around the cabin. The wood-grain patterns on the steering and gear-lever console look premium, and throw some luxury into the mix. The Fortuner’s selling-point, however, was always its built-to-last nature. Even with the use of leather and wood, the hard plastic trim, plus-sized buttons, chunky steering wheel and naked, old-school gear lever remind you that this is utility first, niceties second. Speaking of which, not only do you get bottle holders in the doors, but in the centre console as well. There are flip-out cupholders too and dual gloveboxes with the upper one cooled. The cabin is barren no more and there’s enough gizmos to fiddle with. The new ‘optitron’ instrument cluster includes a large TFT multi-information display, through which, you can shuffle between the car settings menu and the compass, view driving metrics or see what’s playing on the music system. Use the navigation system and turn-by-turn prompts are displayed here too, so you don’t have to take your eyes off the road! The 7-inch infotainment system highlights the dashboard and while it doesn’t look like an after-market add-on anymore, the graphics still look quite similar to what we saw in the outgoing version. It’s not a setup that’ll blow you away and the screen is quite a dust magnet, but it gets the usual range of connectivity options (Bluetooth/AUX/USB) and, of course, navigation. The climate control console looks old-fashioned, but the system is very effective, even in the rear rows. Its wheelbase is 5mm shorter than before, but there’s adequate cabin space in the first two rows. While the rear seat can support three adults, the firm side bolsters of the 60:40 split seat, and rear armrest will make things uncomfortable for the middle passenger. Taller passengers will find headroom lacking in this row too. However, the seat gets fore/aft slide adjustment, can be reclined and the one touch tumble-forward function (like in the Innova Crysta) makes access to the third row simpler. Understandably, the last row is best suited to kids or short adults, as the poor leg space, sloping roof, slimming window-line and all-black cabin makes things claustrophobic quickly. That said, there are AC vents here too along with a large bottle cooler. There’s adequate boot space for a few duffel bags even with all seats up. Should you need more, the third row flips up by tugging on a strap, not to mention, the Fortuner gets a powered tailgate with the height-adjust memory function. Joining the downsizing trend, the Fortuner swaps the old 3.0-litre diesel mill for a smaller, but more powerful, 2.8-litre unit that plates up 177PS. It’s offered with 6-speed manual and automatic transmissions, and we got the latter which gets 450Nm of torque. It’s the same engine as the Innova Crysta in a higher state of tune and as you’d expect, low-end torque delivery is impeccable. A little dab of the throttle is enough to get it surging ahead and what little vibrations creep into the cabin smoothen out quickly. There’s no discernible turbo-lag and it upshifts early since the torque kicks in from as low as 1,600rpm. The engine’s quite refined as long as you’re at low speeds or settle into a cruise. Slam the pedal though and it gets quite loud and there’s oodles of clatter, making it sound a tad agricultural. Driveability is great in the city or on the highway and it’ll do 100kmph while sitting calmly at around 1,800rpm. Speaking of which, our road test saw it execute the 0-100kmph sprint in 12.14 seconds. Since the gearbox now has an added ratio for the highway, you can get those extra kilometres per litre during inter-city trips. Our road test got us 15.04kmpl on the highway and 12.38kmpl in the city. The Fortuner also gets the Eco and Power drive modes and there’s a noticeable difference in throttle response between the two. Eco dulls it down and even sobers the air-con for increased efficiency, while Power is ideal for zipping through trucker traffic on the highway. Not only does the latter liven up performance, it also delays upshifts by a bit. Should you feel the need, the transmission also gets a manual mode and paddle-shifters too. The gearbox offers smooth changes so long as the driving is sedate. It’s not the most responsive unit around, but it gets the job done. Toyota has made M-A-J-O-R improvements in this department. It’s still a body-on-frame setup, but it’s been reinforced, the chassis has been stiffened and the suspension setup’s been reworked too. The result? To begin with, the ride isn’t as lumpy anymore and it feels a lot more stable at highway speeds, with vertical movement kept in check well. Low-speed ride quality is still on the stiffer side and there’s noticeable body-roll, but it’s more predictable to drive now. However, it still handles like a tall-boy SUV and is not a corner carver by any means. The 265/60 section tyres offer adequate high-speed grip, but the Fortuner’s 2,153kg weight and top-heavy nature push them to the limit if you try to take a curve spiritedly. The steering is now electrically-assisted and city driving is monumentally easier since it’s lighter to use (even lighter than the Innova Crysta). However, it lacks feedback and feels vague at dead-centre, so there’s some guesswork involved. Yes, it still feels tough and you can accelerate through broken roads that would push sedans down to a crawl. Of course, the Fortuner gets 4x4 with low-range and a knob to switch between the drive modes – H2 (default mode for road usage), H4 (muck, sand or slush) and L4 (extreme off-road use only). What impresses though, are the brakes. All wheel disc brakes offer great stopping power and are a welcome, much-needed replacement for the old disc/drum setup, especially since the new model is around 200kg heavier. 7 airbags come as standard, as do ABS with EBD, 3-point seatbelts on all seat rows and ISOFIX. Hill-descent control is exclusive to the 4WD version, and except for the 2WD MT, all variants get vehicle stability control, brake assist and hill-start assist too. Toyota has taken an “If it ain’t broke, don’t fix it” approach with the new Fortuner. It retains old qualities like its menacing proportions and solid build, while improving on shortcomings like the interior, ride, brakes and heavy steering. While, on the surface, it seems revolutionarily new, Toyota has essentially plugged in gaps in the Fortuner’s package. The things people bought a Fortuner in spite of, have now become the reasons you’d actually get the Fortuner for! However, at Rs 25.92-31.12 lakh (ex-showroom, Delhi), it’s more expensive than ever before and it isn’t really unique, so the ultimate deal maker is still that Toyota badge.